Samsara is an exquisite luxury 7-bedroom beachfront Turks and Caicos villa sleeping up to 24 people. The villa is set in almost four acres of land just off International Drive in Providenciales. This is where you will find many of the most exclusive and luxury villas in Turks and Caicos. This luxury vacation rental is aptly named as the word Samsara means flowing on or passing through in Buddhism. And everything about Samsara villa flows beautifully from the main house to the terrace and all the way to the beautiful 650-foot private beach just below the villa. The trade winds flow beautifully through the house providing a seamless and perfect indoor-outdoor living space. This tropical paradise is awash with the colours of turquoise waters and white sand beaches. The moment you step inside the front door, you will need to pause and just appreciate the beauty around you. There are no words to describe the first glimpse to the pool, gardens, and sea. You will immediately feel the stresses of modern day living lift from your shoulders as you enjoy the view of the crystal-clear waters and gentle breezes. Samsara is laid out in unique and private pavilion suites that are set in stunning tropical gardens which surround the central area of the house where the living room, kitchen, pool and lovely terrace are located. Samsara Villa provides many dining options making it feel like you can eat in a different place every day. The main alfresco dining pavilion is perfect for larger groups and can seat up to 22 people. The kitchen is probably the most beautiful we have come across as it is located ocean side with stunning views of the azure seas and beach. There is seating for up to 14 people around the table and kitchen counters and is an ideal location for a casual bite. 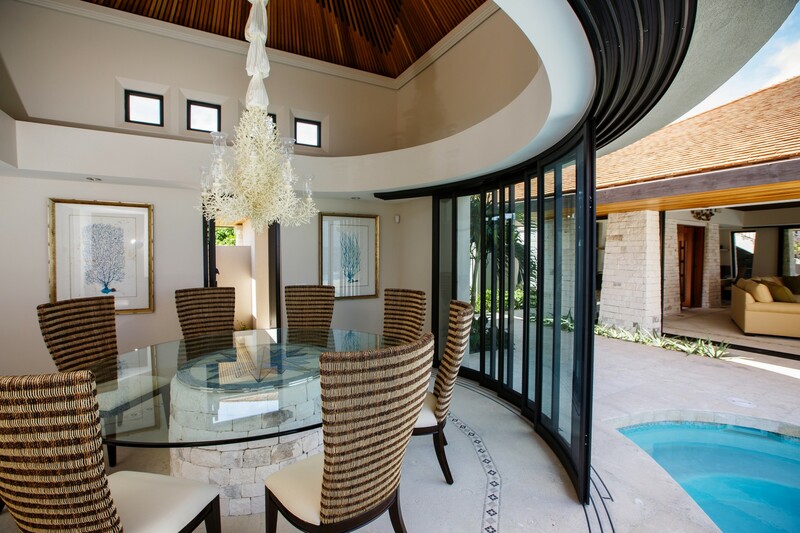 The formal dining room is quite unique as it floats above the pool and has semi-circular glass sliding doors opening up to the pool. It is a beautiful room with double height ceilings and an exquisite local stone table with a handmade mosaic. For a relaxed dinner, you can heat up the barbeque and enjoy some delicious local seafood followed by a soak in the plunge pool listening to the waves and looking at the millions of stars. But no matter where you eat, you will be guaranteed panoramic views. The Samsara kitchen whilst absolutely beautiful is also very practical. It opens on three sides to the view. It is fully equipped with stainless steel appliances, a granite top, a large pantry, family sized freezer, and wine fridge. There are utensils that would impress even the most discerning chef. We are also happy to pre-stock the kitchen so that when you arrive, all you need to do is relax. The under lit swimming pool in Samsara is worth a special mention. It is resort size infinity pool with a bridge that leads to a plunge pool, a swim-up bar and several levels from where you can enjoy the views of sea and beach and the endless horizon whilst staying cool in the pool’s refreshing waters. The pool at Samsara is the focal point of the villa, and the surrounding terrace is where guests tend to gather to enjoy the beautiful Turks and Caicos Sun. In the evening, the pool area turns quite magical with subtle lighting and a fire pit. There is a lovely hammock garden located in a beautiful citrus grove where you can relax, enjoy a book or have a nap. This is where you will be able to breathe in the scents of the tropics and enjoy the relaxed pace of life that is the Caribbean. The gardens are full of sweet-smelling tropical flowers as well as palm trees to provide natural shade. If you like to stay fit on vacation, there is a floodlit fully landscaped tennis court which can also be used as a basketball court. There is a covered seating pavilion with views over the sea. Should you wish to improve your game whilst on vacation, we can organize fully qualified tennis coaches for you at any time of the day or evening. The beach stretches 650 meters to the east of Samsara making it perfect for a morning or evening walk. The Sunrise Pavilion is perfect for enjoying some morning yoga. Samsara has eight-bedroom suites located in their own individual and private pavilions within the four acres of gardens. Each one has en-suite bathrooms and opens up to either a balcony or terrace. The Master suite is incredible and comprises of over 1000 square feet of luxury space located beside the pool. It has his and hers dressing rooms and a huge bathroom suite with indoor and outdoor showers as well as a double jacuzzi bath. Samsara is really well set up for children with a special bunkhouse which has two children’s bedrooms (Mermaids for the girls and pirates for the boys) that can sleep up to 12. The bunkhouse has an amazing loft full of games and toys where children and meet and socialize and have great fun. THE BEACH just below Samsara is beautiful with stunning white sand and crystal clear turquoise waters. There are lots of coral reefs running parallel to the beach making the area one of the best in Providenciales for snorkelling. This area is also one of the best areas on the island of Provo to enjoy nature. There are Hawksbill turtles, Ospreys, Humpback Whales, thousands of tropical fish, and hundreds of migratory birds to be seen. Samsara villa in Turks and Caicos is an absolute paradise. It provides resort type facilities and service together with all the privacy and exclusiveness of being in your own home. Samsara Villa in Turks and Caicos is ideal for a multi-generational family gathering, a tropical wedding, anniversary party, special party, corporate event or a get together with friends and loved ones. There is no doubt that any stay in Samsara will provide its occupants with memories for a lifetime. When you stay at Samsara Villa, you will receive professional housekeeping and laundry service. In additional our complimentary pre-arrival concierge team will be delighted to arrange professional chefs for during your stay. This may range from one special meal to a full-time chef service. All the chefs have been handpicked and serve the freshest modern cuisine using local and organic produce where possible. We are also happy to organize live entertainment. There is nothing quite like listening to some beautiful singing, live jazz or a traditional steel pan band whilst enjoying a cocktail as the sun goes down. Villa Samsara has a beautiful location directly on Babalua Beach which is on the western side of famous Grace Bay Beach. The villa is in an elevated position ensuring panoramic views from all the communal areas and many of the bedrooms. Samsara Villa is also located close to Smiths Reef which is a colorful coral reef area with exotic sea life that is perfect for snorkelling. Grace Bay beach which has been consistently awarded the title of the worlds best beach is just a few kilometers away. The Princess Alexandra National Marine Park which is one of the world’s most beautiful is also very close by. Bedroom 1 Master Suite: King sized bed, ground floor, air-conditioning, safe, ceiling fan, grand poolside sleeping pavilion, entertainment system, television, his and hers dressing room, separate bathroom suite with dual vanity, indoor and outdoor standalone rain shower, double jacuzzi bath, opens up to pool with stunning views of the Caribbean ocean. Bedroom 2 King Ocean Suite: King bed, air-conditioning, ceiling fan, safe, smart TV, Apple TV, sitting area, en-suite bathroom with twin vanity, indoor rain shower, outdoor shower, access to 400 square foot private terrace with outdoor furniture including sun loungers and an outdoor sofa. Additional space to accommodate a crib. Bedroom 4: Upper balcony suite Two single beds (can be made up as a King double), first floor, air-conditioning, ceiling fan, safe, en-suite bathroom with standalone shower and dual vanity, direct access to balcony with beautiful ocean views.